The Salvation Army’s Bridging the Gap program provides youth with the skills they need to keep their lives on track. Hunger is a hidden pain. Will you help us relieve it? Help us put food on our shelves for those in your community who are going without. Our After School Literacy Program helps to equip children with basic skills to achieve grade level standards. Serving people in need. The Salvation Army provides services without discrimination. The Salvation Army provides services without discrimination. 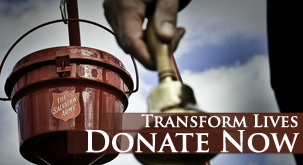 The Salvation Army helps people from all walks of life when they have no where else to turn. You're invited to join our weekly worship services. This innovative program is designed to provide the support and skills they need to keep their lives on track. The twelve-unit life skills curriculum focuses on intervention. Kids learn about the resources available in their community, the effects of drugs and alcohol, peer pressure, life skills, how to control anger, how to build self-esteem, and how to make family relationships work. Volunteers from all walks of life strongly support The Salvation Army in almost all of its activities. Their time and commitment are essential to the success of the organization. Volunteers, contributors and other supporters make our services possible. Whether you're packaging meals to distribute to those in need, or painting a room at one of our corps, there are countless ways for you to give back to your community and offer the priceless gift of your time. There are opportunities to volunteer for individuals, families, schools, organizations and businesses. For more than 125 years The Salvation Army has been delivering services and hope to the less fortunate in Massachusetts. Internationally, it is an organization with a lineage of public service that dates back to 1865, and has evolved over the decades into a social service provider with an unmatched scope and breadth. The Salvation Army currently has representation in over 125 different countries worldwide, in addition to nearly 8,000 centers of operation across the United States. Its ministry is motivated by the love of God. Its mission is to preach the gospel of Jesus Christ and to meet human need in His name without discrimination.